Odubel Herrera #37 of the Philadelphia Phillies is congratulated by Tommy Joseph #19 after scoring on a double by Howie Kendrick #47 during the first inning against the San Francisco Giants in a game at Citizens Bank Park on June 4, 2017 in Philadelphia, Pennsylvania. PHILADELPHIA — For most of this season, the Giants have lost games because of a lack of offensive production. Sunday’s defeat was a bit of a throwback. The lineup bailed Matt Moore out but the bullpen couldn’t hold the lead. 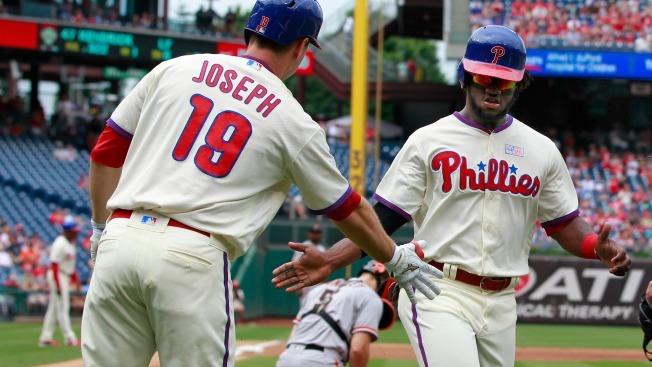 The Phillies tied the game in the seventh and Maikel Franco took Derek Law deep leading off the eighth. With a 9-7 loss at Citizens Bank Park, the Giants became the first team to lose a series to the Phillies since the last week of April. --- The Giants trailed by three heading into the sixth, but Brandon Crawford hit a two-run homer in that inning and a two-run single in the seventh. Crawford entered the day with a .222 average with runners in scoring position. --- Moore was charged with four earned on six hits and two walks. In seven road starts this season, he has a 7.94 ERA. He’s at 2.57 in five home starts. --- A single, error and two walks drove in a run and loaded the bases in the third. The Giants settled for just one more on a sacrifice fly. They are bottom-of-the-league in just about every hitting category, but they do lead the Majors with 23 sacrifice flies. Coming into Sunday’s game, only one other team (St. Louis, 18) had more than 15. --- Hunter Pence came on in the seventh on a double-switch after missing 20 games with a hamstring injury. He hit into a double play to end the top of the eighth. --- Odubel Herrera bat-flipped majestically on a fly ball to left in the second inning. He blasted a homer to center off George Kontos in the fifth and did not flip his bat. He remains a mystery.